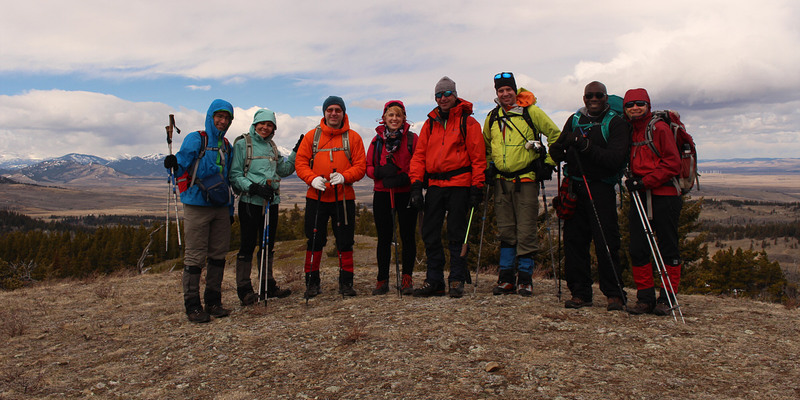 On 15 April 2017, I joined Wietse Bylsma, Asieh Ghodratabadi, Rafal (Raff) Kazmierczak, Houmaro Kone, Taras Kurylo, Ali Shariat, Dorota Sokolowska and Zosia Zgolak for a hike up Mount Baldy, Mount Albert and Piney Point Ridge at Beauvais Lake Provincial Park near Pincher Creek, Alberta. For this trip, we got our route descriptions from Bob Spirko and Vern Dewit who, in turn, drew their inspirations from Dave McMurray. 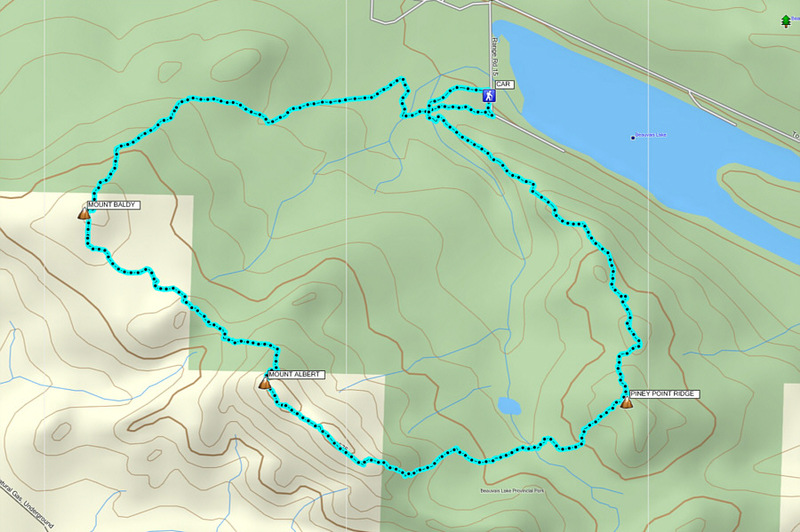 Like those that came before us, we chose to hike the circuit in a counter-clockwise direction by ascending Mount Baldy first. From the parking lot at Beaver Creek Day Use area, we headed west to the ruins of Lower Smith Homestead before working our way up a confusing network of trails leading to the top of Mount Baldy. 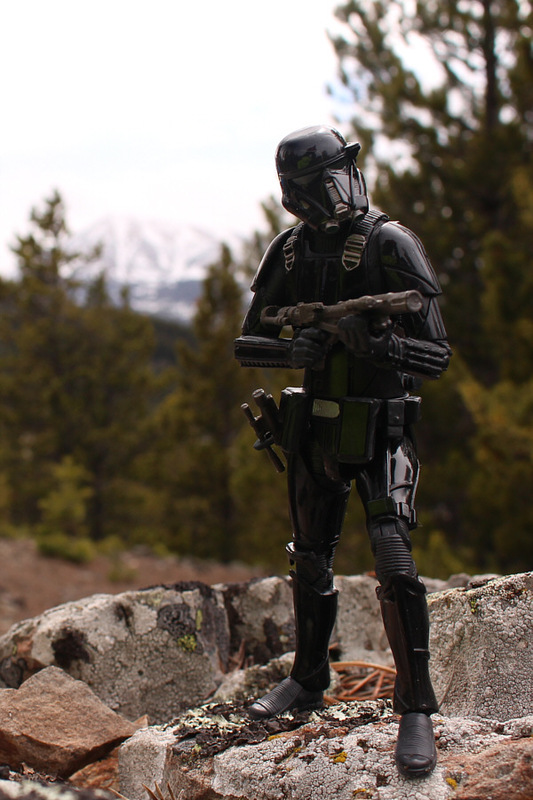 There were some lingering snow patches in the forest, but the snow was generally supportive and easy to walk on. From the top of Mount Baldy, we headed southeast and followed the connecting ridge to Mount Albert. Although the trail was a little hard to follow here, orange markers helped to keep us on track. 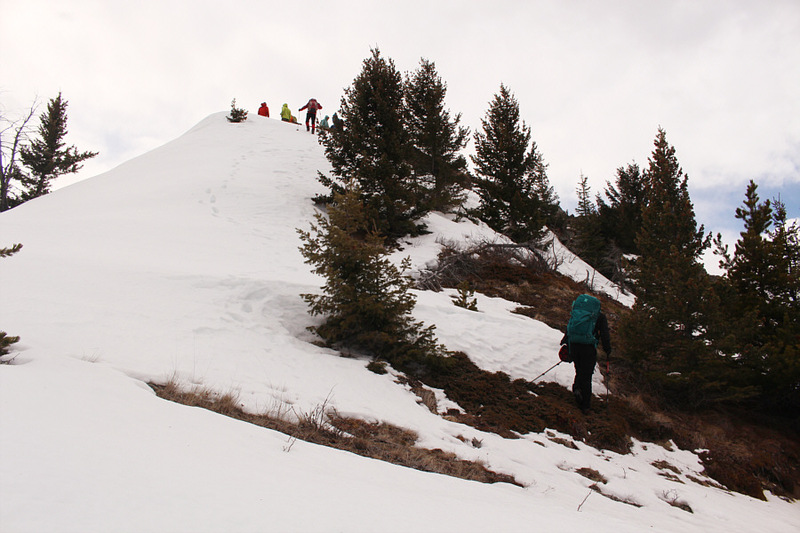 The steep section just below the summit was snow-covered and a bit icy, but everyone managed to climb up to the top without too much difficulty. 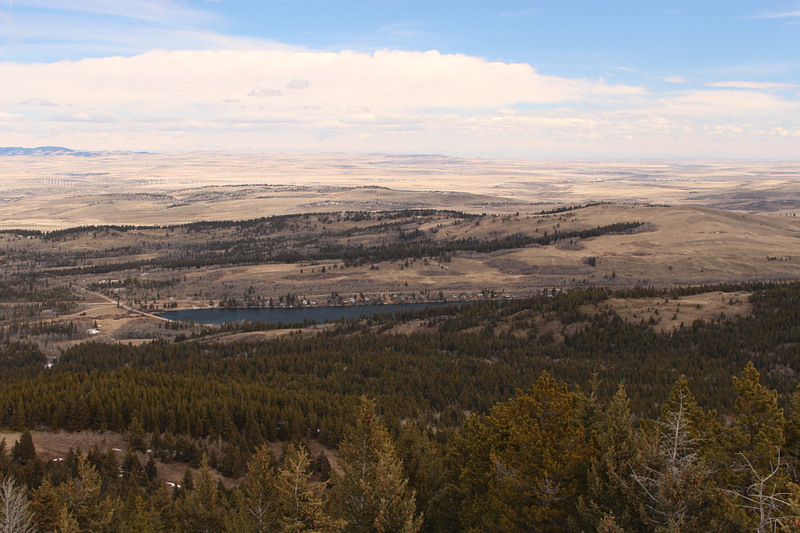 Because of a blustery wind, we only stayed long enough to snap a few summit photos before dropping down a short distance along the southeast ridge to take a break in the trees. 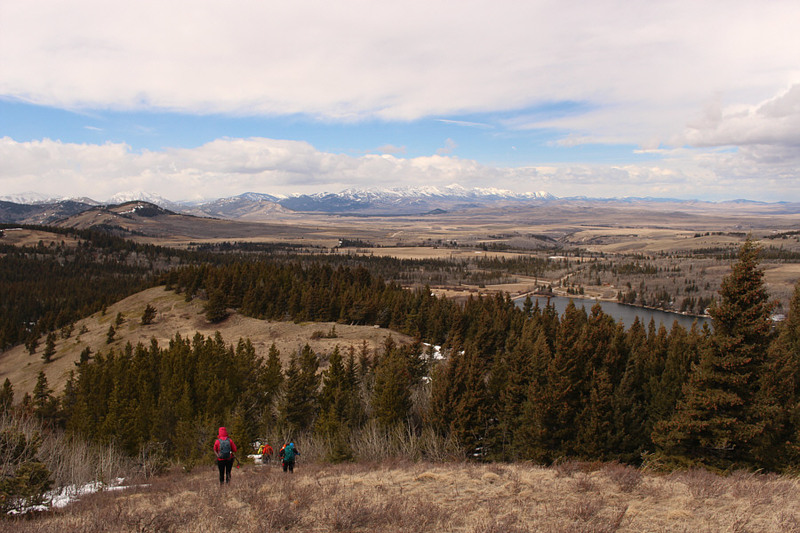 After having our fill of snacks, we continued to follow orange markers along the ridge and eventually descended open slopes to a marshy valley east of Mount Albert. 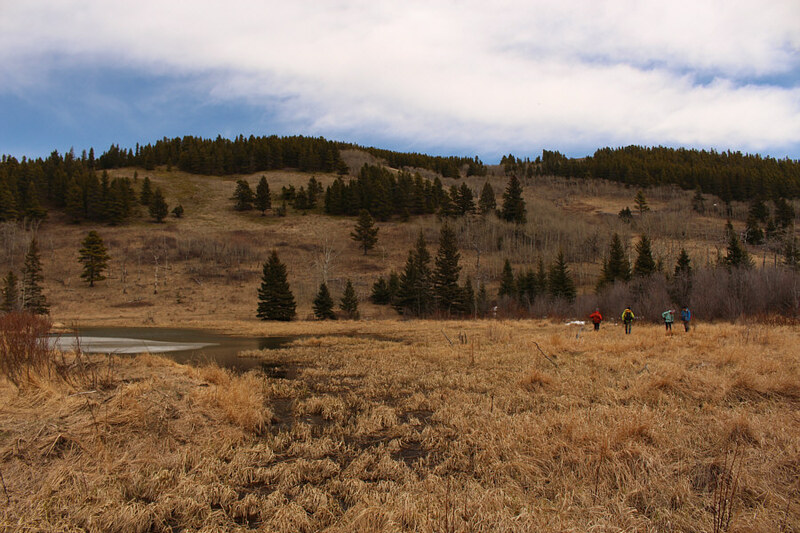 The biggest challenge here was trying to keep our feet dry as we crossed a marsh to the base of a grassy slope below Piney Point Ridge. Piney Point actually refers to a scenic viewpoint near the north end of its namesake ridge, but we first climbed up the aforementioned grassy slope to the ridge's actual high point. The trees covering this high point obscure much of the surrounding views but at the same time provide effective shelter from the wind. As a result, we hung out here maybe a bit longer than warranted before plunging downhill through the forest to the north. There was still quite a lot of snow here, and some of it was beginning to turn isothermal. Thankfully, the post-holing was not bad, and the snow petered out once we reached Piney Point. Here, we picked up a marked trail again and followed it without too much trouble back to Lower Smith Homestead and subsequently the parking lot. Starting from the parking lot are (L to R), Houmaro, Wietse, Dorota, Taras, Ali, Asieh, Raff and Zosia. 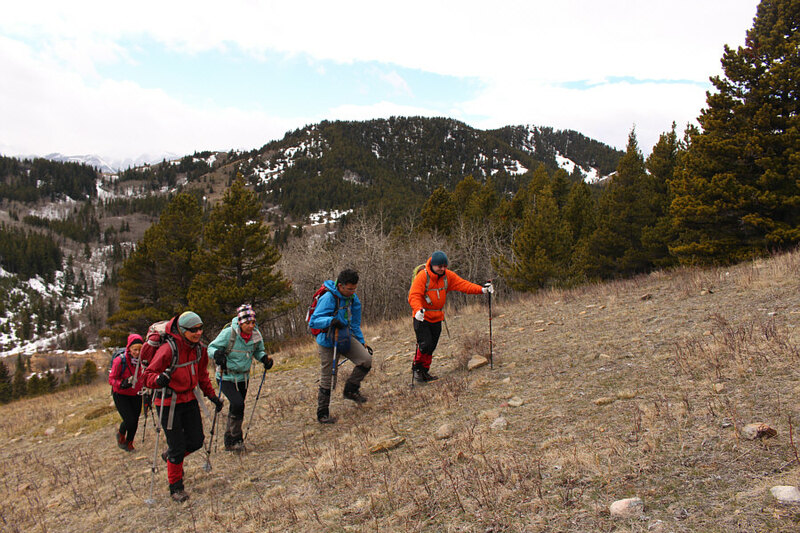 The group hikes up the snow-covered trail to Mount Baldy. The group gathers around a bench near the summit of Mount Baldy (1583 metres). 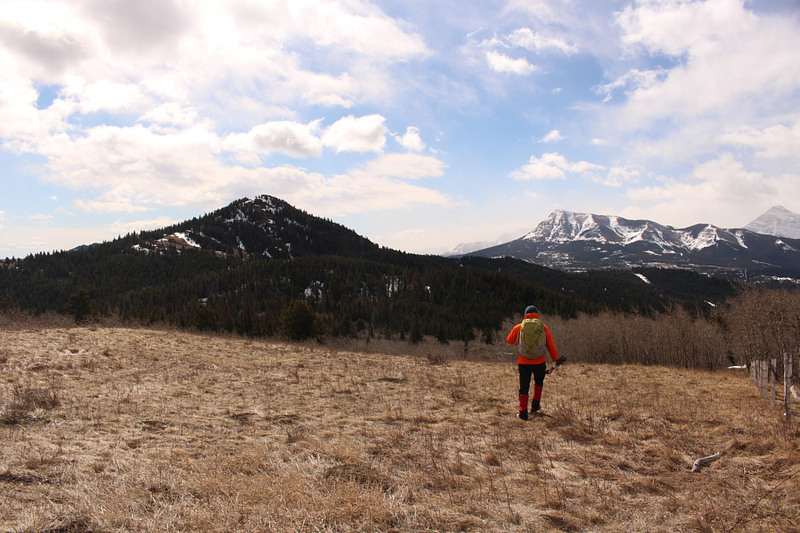 Taras leaves the summit of Mount Baldy and heads for Mount Albert (left). Visible at distant right are Prairie Bluff and Victoria Peak. The trail to Mount Albert (upper right) from Mount Baldy is not well-defined, but the terrain is easy to navigate. 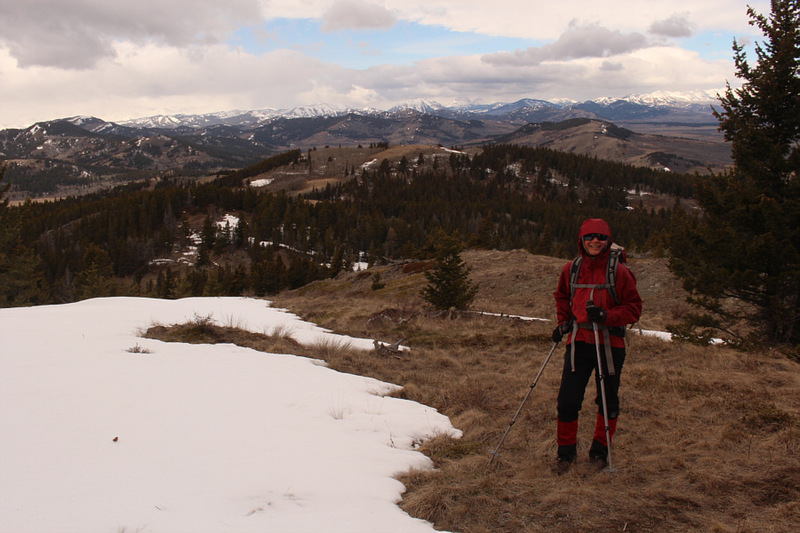 Zosia hikes up the north ridge of Mount Albert. 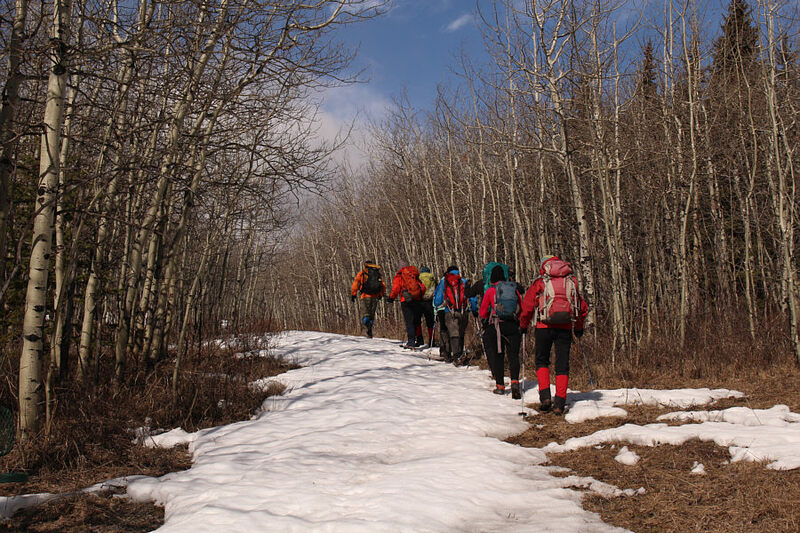 The last section before the top of Mount Albert is steep and snow-covered. 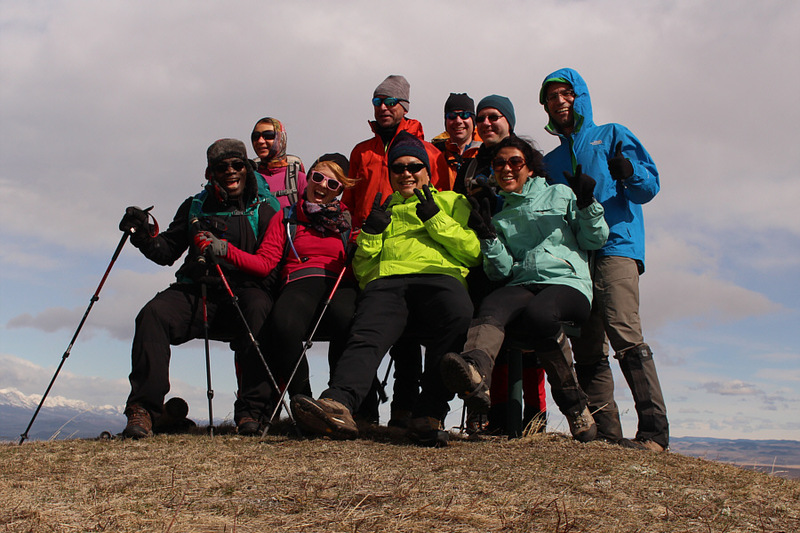 L to R, Sonny, Zosia, Ali, Asieh, Wietse, Houmaro, Taras, Dorota and Raff celebrate on the summit of Mount Albert (1698 metres). 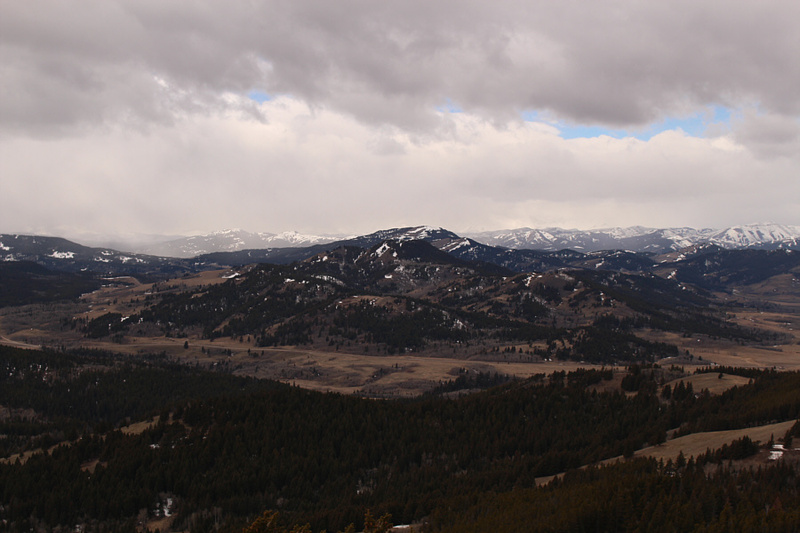 With clouds obscuring bigger peaks to the west, lowly Mount Backus stands out in the foothills. Beauvais Lake is visible to the northeast from the summit of Mount Albert. 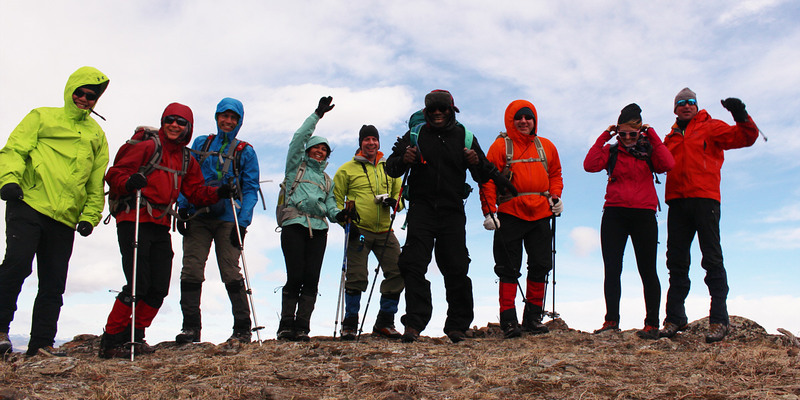 The group descends the southeast ridge of Mount Albert to escape the wind. At right is Prairie Bluff. 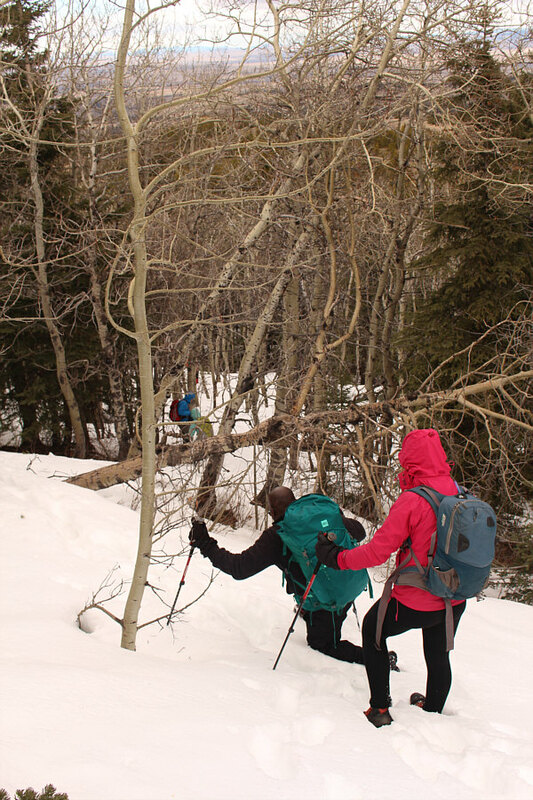 Taras and Zosia work their way down the slope toward the valley at centre. At left is Piney Point Ridge. 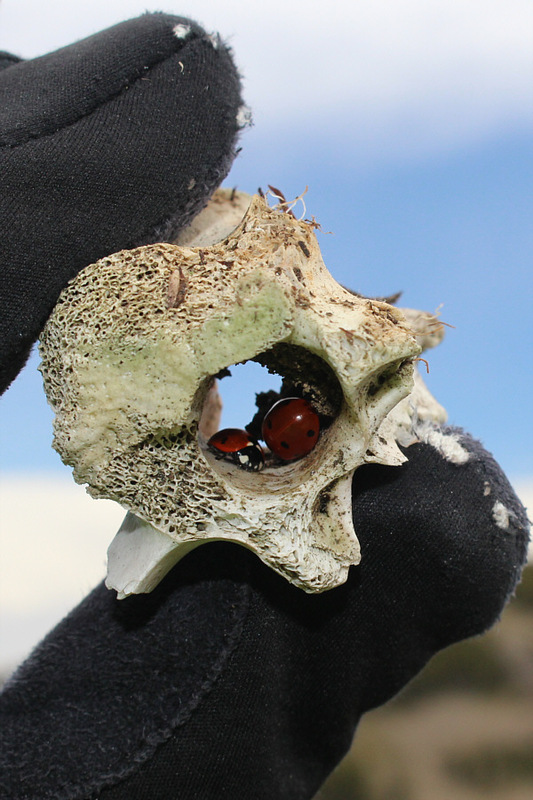 A couple of ladybugs appear to be sleeping inside the spinal canal of a vertebra. 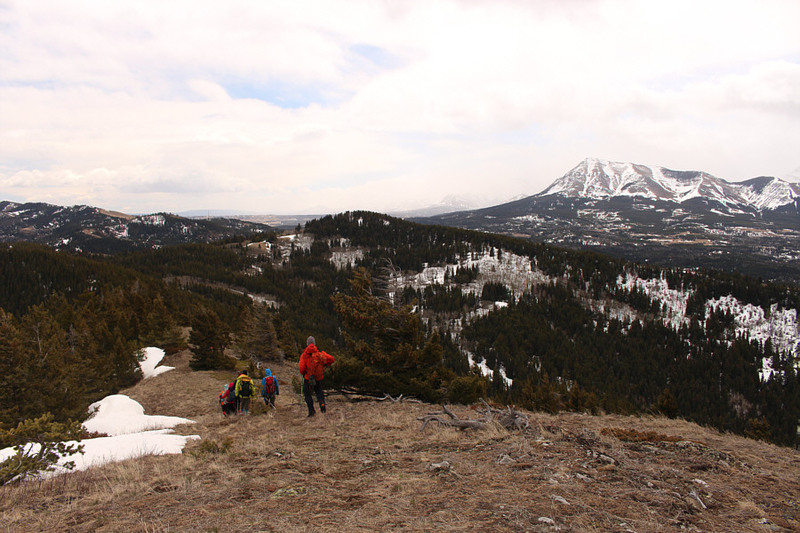 The group crosses a fen before climbing up Piney Point Ridge. 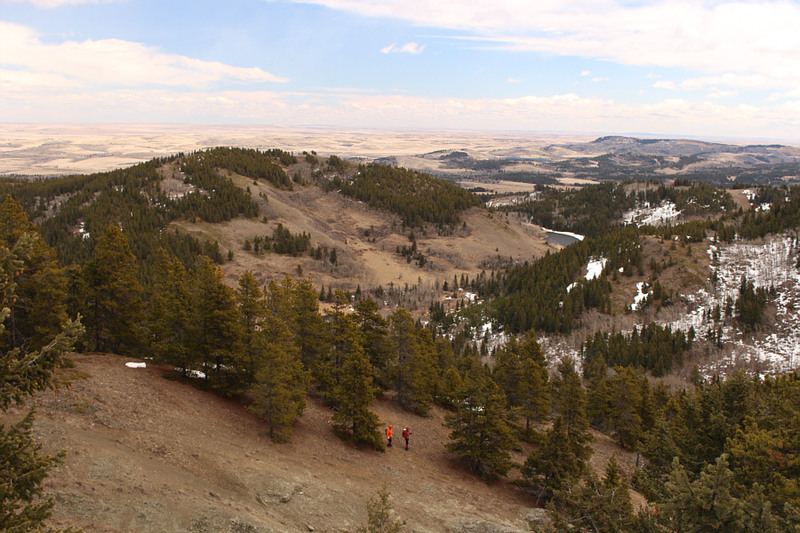 The group ascends the west face of Piney Point Ridge. Mount Albert is visible in the distance. 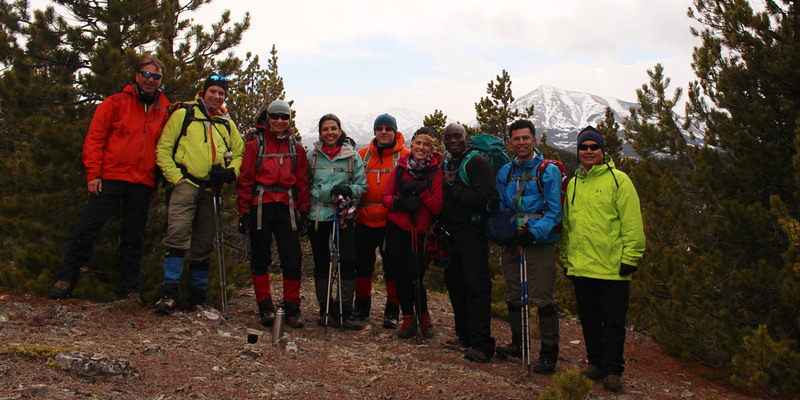 L to R, Raff, Wietse, Zosia, Asieh, Taras, Dorota, Houmaro, Ali and Sonny stand on the high point of Piney Point Ridge (1601 metres). Dorota watches as Houmaro struggles a bit in the deep snow while descending the north side of Piney Point Ridge. 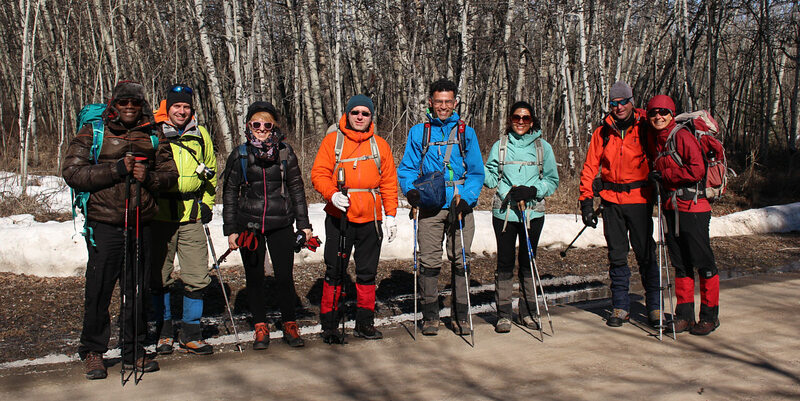 The group gathers one last time at Piney Point (1560 metres). 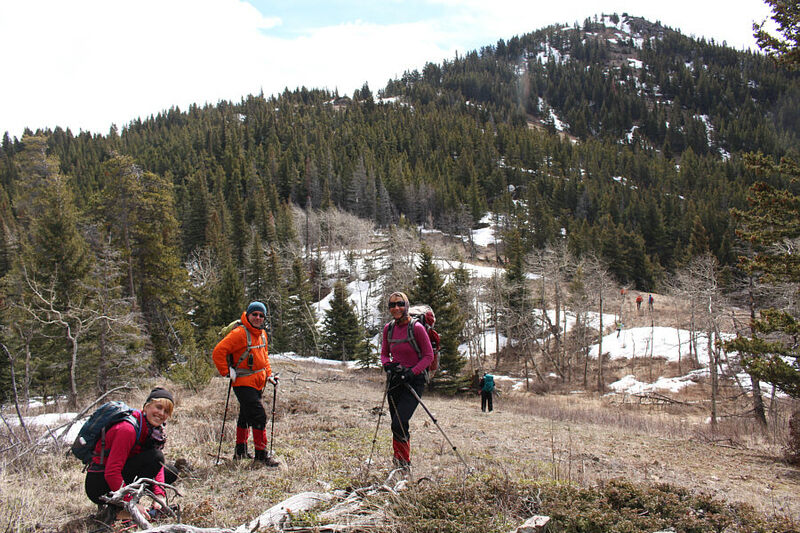 The group descends the north end of Piney Point Ridge to complete the loop hike.